Cooking class at the Sin Yaw Guest House. NYAUNG SHWE, Shan State — For visitors to Inle Lake, in southern Shan State, the town of Nyaung Shwe is the main access point. A few weeks ago, I visited Inle with a list of things to do around Nyaung Shwe. And since a cooking classis is the best way to get to know any new place, it was at the top of my list. I booked my class at the popular Sin Yaw Guest House. Students need to book their place a day ahead because the owner, Sao, needs to prepare the ingredients and other things. Preparing the ingredients for the dishes. When you book, Sao will ask if you want to go shopping with her at the market. I decided to skip the market because I didn’t have enough time, so they bought all the ingredients for me. When I arrived at Sin Yaw’s rooftop classroom, it was about 10 a.m. and Sao was waiting for me and my friend with a table prepared with a small gas stove, vegetables and other ingredients. Students can choose the menu for their class. 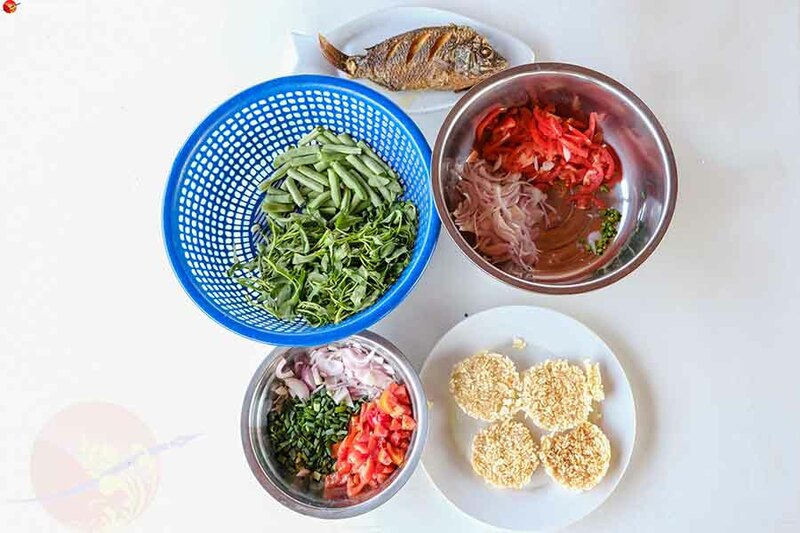 I chose a few fast and easy dishes including Inle potato rice, Inle fish curry with spring onions for the main dish, tomato salad, and potato and green bean curry. Other options include Inle fried spring onion with pork, Shan chicken salad, and Shan style chicken or pork with pineapple and cashew nuts. Sao was very helpful and patient in answering our questions, walking us through the class step by step. She and her staff had already cleaned the vegetables and prepared the fish for us. We just had to cook them following their instructions to end up with a delicious Inle meal. We started by boiling the potato and tomato for the Inle potato rice, which took 45 minutes to prepare. While they boiled away, we rubbed a large stone fish from Inle Lake with salt and turmeric and fried it in hot oil for the Inle fish curry with spring onions. We chopped the onions and tomatoes into small pieces for the gravy and cooked them until they were soft, then added some salt and chicken powder. 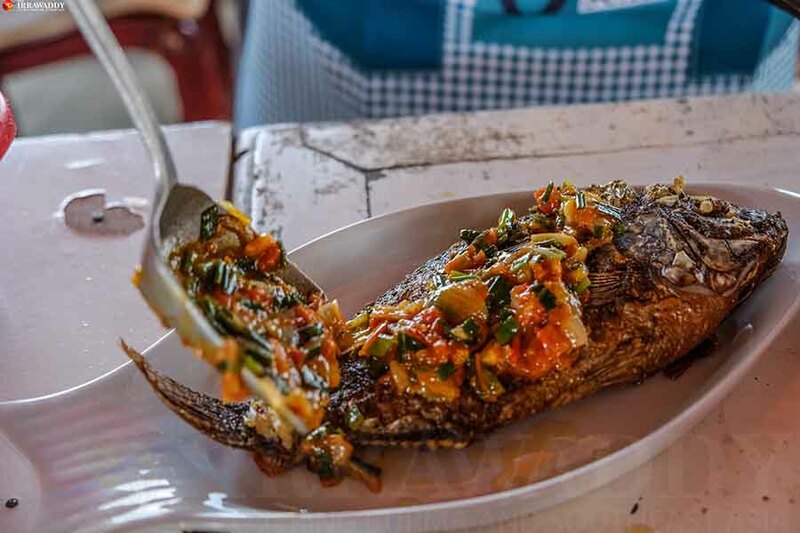 Pouring the spring onions on the fried fish. The smell was sweet and made us hungry. We poured the gravy over the fish and the dish was ready. We moved on to the Inle style tomato salad. What sets it apart from other tomato salad is the liberal use of crushed roasted peanuts. It was not difficult to make. We just had to mix the onion and tomato with the nuts and add salt. By this time the boiled potato and tomato were ready and I peeled off the skins. Then we cut the potato into flat slices, mushed them with some Shan rice and salt, pressed a few of the balls into pancakes and sprinkled them with some roasted nuts. The Inle potato rice was ready to eat. Sao said the last side dish, the potato and green been curry, was especially popular among the Innthar, or people of Inle, many of whom eat it every day. My friend cooked that one while I prepared the potato rice. Our meal is ready to eat after class. 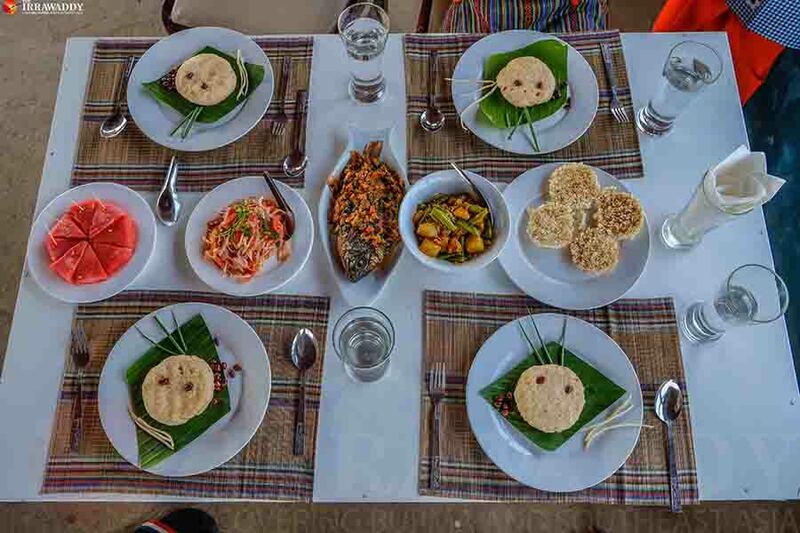 The cooking class lasted about three hours and cost 15,000 kyat ($11.22) per person. We used tomatoes in every dishes. The Innthar eat a lot of tomatoes because they have many floating tomato farms on Inle Lake. We had a lot of fun. We learned all about the ingredients and what was going on with each dish. Sao and her two staff were lovely and very friendly. All the dishes we cooked were tasty and we ate them all after class. Our lunch came with bottled water and watermelon. I’m not an expert cook, but it was lovely to try and nice to learn about a new place through its traditional cuisine. 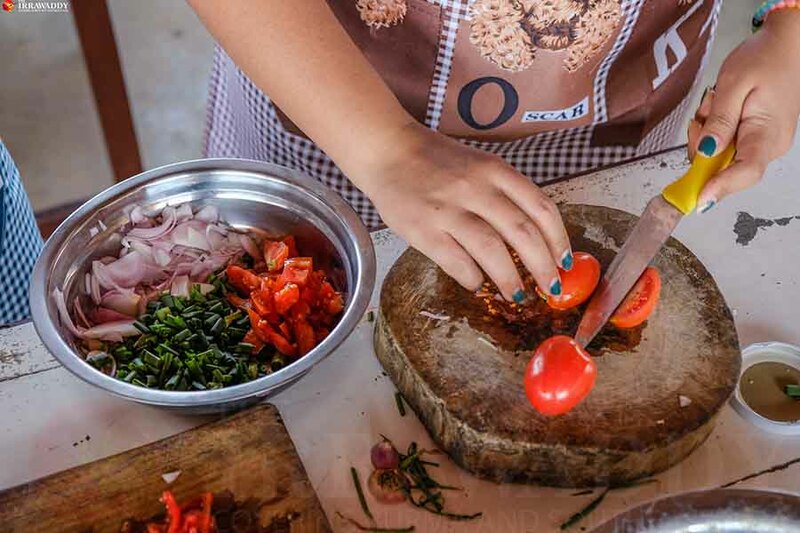 Nyaung Shwe has a few other cooking class options, and you should definitely try one if you’re in town. If you have the time, I recommend taking the trip to the market to see where the ingredients come from. To book a class with the Sin Yaw Guest House, you can send a message to its Facebook page, Sin Yaw Guest House and Restaurant, or call 09 960 743217.